Our White Shark. The slightly different wheat bock. 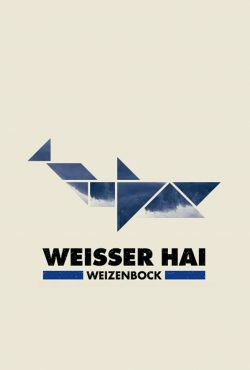 The “Weisser Hai” (White Shark) is a dry-hopped wheat bock (see below), in which the hop plays an essential role and thus contributes to a subtile bitterness. The white shark can be served with a hearty roast or game. Hazy and orange-yellow shining like the setting sun on the ocean, this wheat bock lies in the glass. The smell of ripe banana and lightly resinous aromas beguile the nose and whet your appetite for the first sip. On the palate, at first, completely harmless juicy notes of banana and physalis circle the tongue. But this harmony is deceiving, because at the finish the white shark beats with another berry hops aroma, which brings the Hallertau Comet hops and reminds you of blueberries and blackcurrants. The alcohol level of 6.8% Vol. remains deceptively in the background. But always remember: One white shark too much and they tear you to pieces! Well chilled in a wheat or tasting glass to consciously enjoy the fresh hop aromas. The “Weizenbock” is a wheat beer, which has at least 16 ° P original wort, a stronger brewed wheat beer. Wheat beer is beer brewed with at least 50% wheat malt. Names for these beers are “wheat” or “white”. “Wheat” and “white” have the same etymological origin. Wheat beers are top fermented. 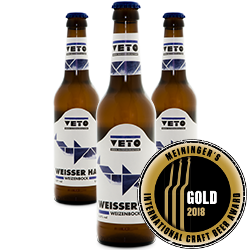 In Austria, Altbayern and Mark Brandenburg, wheat beers (“Weizenbier”) are also known as white beer (“Weißbier”).